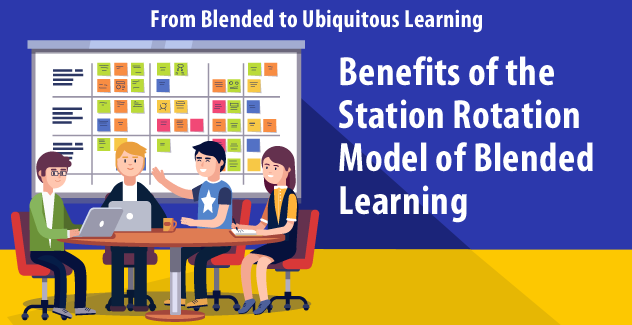 After looking at the flipped classroom model in our last post, this time we will be discussing the benefits of another frequently used model, rotating stations. While the flipped approach is the dominant model in higher education, the stations approach is the most popular in the K-12 school environment. That is due principally to the fact that this model combines great flexibility—with a variety of customization and supervisory options—with multiple peer collaboration possibilities. We will examine each of these in more detail. In the flipped classroom approach, content is normally delivered through student use of digital content on computers and mobile devices. This is one of the principal aspects of the stations model as well. However, how students use the digital materials can vary. While it is possible to have students work on content outside of class, the stations model also frequently involves student use of computers in classroom sessions. That might mean all students at computers in a lab environment at the same time, or students using computers or tablets in smaller groups. In fact, the big advantage of the stations model is having students in groups rotate through a variety of learning activities. Tablets (iPads or Chromebooks) are especially effective in this use, as their portability, instant-on functionality, and ease-of-use make it quick and easy to set up customized configurations on the fly. Breaking up the class into smaller groups allows stations to accommodate students at different levels of learning mastery or needing different kinds of assistance. Rotating stations allows for students to progress through a variety of activities, addressing different learning styles and approaches. This is particularly useful in a K-12 environment in which students' attention may wander if an activity goes on for too long. As students rotate through stations, they will engage in learning activities that provide rich opportunities for consultation and collaboration, whether that be with instructors, tutors, or peers. That can involve use of digital devices, face-to-face conversations, or interactions with physical objects or instruments. This will vary with the discipline. For some areas, hands-on tasks will be an essential component to be included. That might require individual or pair work. For other subjects, the principal learning will involve small group discussions. The format allows for many different possibilities, but the small group work that is at the core of the model especially enables and encourages collaborative learning. While there are many different learning theories, it is universally acknowledged that having students work together is likely to lead to deeper learning. This also allows a collective thinking approach to problem-solving or project development. Collaborative work can also be done online but may be best suited to physical spaces. Indeed, that is the point of blended learning models, using different virtual and physical spaces for what they enable most effectively. In the stations model, the teacher will usually start with a full class introduction of the activities for the day. The students then move through a series of stations, with the rotation either being fixed or under some degree of student control. Building in student choice accommodates student interest, contributing to greater motivation and learning engagement. To the extent possible, each station should offer differentiated instruction, with options available that cater to students individualized needs. That is one of the advantages of digital learning materials, which, compared to traditional content delivery, can more easily offer different learning paths and content options. In the next post we will look at additional models and especially the benefits that mobile devices can bring to blended learning.